Now, the question is, how would you tell the control to add these form variables ? There are no Properties in this control that create these html form variables. In order to support such scenario, the control comes with a Collection Type property named AdditionalFormVariables which can be edited both in Design Time (Web Form Scenario) Collection Editor and Run Time (programmatically). 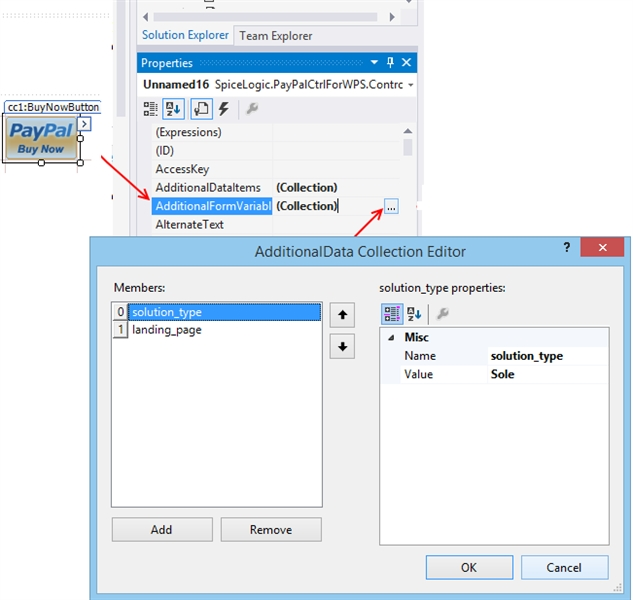 Here is the screenshot of that collection editor that creates these 2 extra variables. This feature can be utilized when PayPal add some new variables for more features but say we did not encapsulate the new feature in our latest version. In that case, you may not need to wait to use those new feature until the time we release a new version, rather you can use this AdditionalFormVariables property to add the new variables and keep using our control as usual.